Designed to fit deep letter or legal-size file cabinets, this Staples file caddy features four 1.75-inch wheels, allowing you to effortlessly transport files around your office or put them away for storage. Use this Staples file caddy to move your file cabinet, so you can clean hard-to-reach areas and keep your work area tidy. Made from 30 percent post-consumer materials, you can rest assured that you are helping to do your part for the environment. Make more efficient use of limited office space with the Staples file caddy. This sturdy wheeled caddy makes it easy to move even the most cumbersome file cabinets, allowing employees to relocate multiple files to work spaces or conference rooms for increased efficiency and organization.Fully Adjustable and ConvenientThe Staples file caddy adjusts from 18 to 26.5 inches, allowing it to accommodate both standard letter and legal-size file cabinets while adding only 2.5 inches to the cabinet's height. The caddy is easy to assemble and features solid metal construction that supports even heavy cabinets.A Tidy OfficeThe Staples file caddy allows you to easily move file cabinets when you want to clean behind and underneath them. 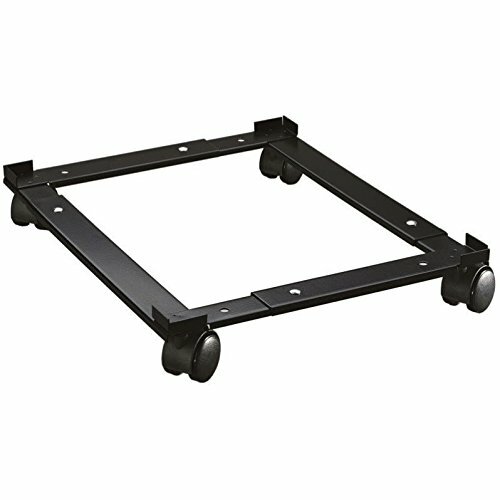 Its wheeled construction makes it easy to roll otherwise unwieldy cabinets away from walls and corners, exposing areas that are likely to collect dust and grime.